Biographies about politicians can give a fascinating insight into the individuals behind the carefully constructed speeches and public appearances. Perhaps we can also learn a lot about a political figure from their conduct during recreational activities. Are they considerate to other members at their gym? Do they play fair at tennis? We don’t expect our leaders to be football stars, but we do hope they treat others with respect once they’re off the clock. Could a new book which delves into the golfing life of President Donald Trump give us a warts and all glimpse at the man behind the mysterious orange mask? 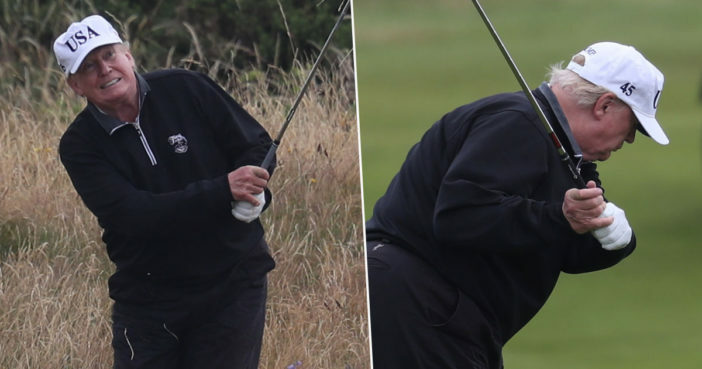 Written by acclaimed sports writer Rick Reilly, Commander In Cheat: How Golf Explains Trump is reportedly ‘an uproarious indictment of Donald Trump’s lying, cheating, and poor sportsmanship’. A snippet of the upcoming book has been published in Politico, offering an intriguing insight into what it takes to caddy for Trump. There are more than a few members at Trump Washington who’d love to hit Trump in the head. A valet told me, ‘We had a bunch of them quit when he won’. Most of the anti-Trump crowd stayed, but they resist in their own small ways. A.J. (who asked that I not use his last name in my book) is so loyal that if someone criticizes Trump, he’ll fight him — and has. One day, when the 2017 Senior PGA Championship was being held at Trump Washington, he overhead one of the Tour pro’s caddies – Brian ‘Sully’ Sullivan – dissing Trump.